Subject: Antique print, untitled. Landscape with a ruin. 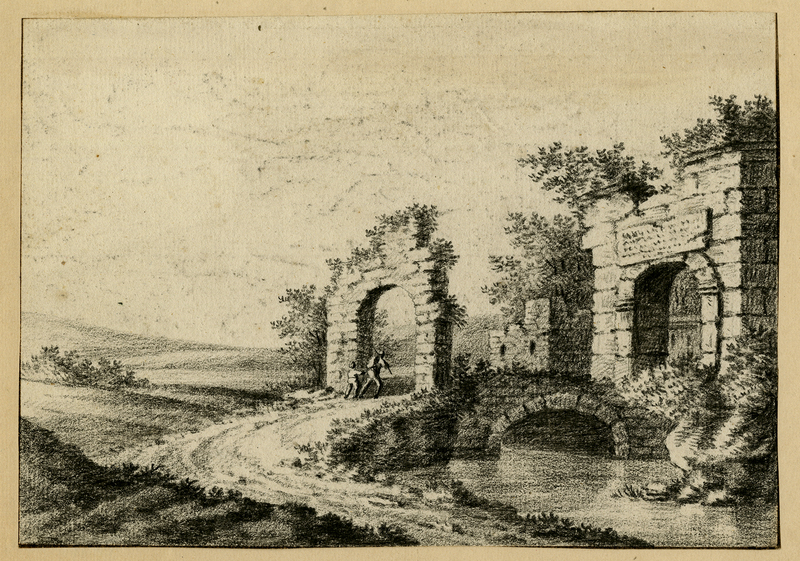 A traveller with his son pass under an arch to cross a stone bridge into the ruin. Condition: Good, given age. Attached to carrier sheet. Margins cropped to the image edge. Faintly dampstained in the top edge of the sheet. Some soiling in the image and a small stain in the left edge of the image. General age-related toning and/or occasional minor defects from handling. Please study scan carefully. Size (in cm): The overall size is ca. 22 x 16 cm. The image size is ca. 19.3 x 13.5 cm. Size (in inch): The overall size is ca. 8.7 x 6.3 inch. The image size is ca. 7.6 x 5.3 inch.